Make a picture frame for the fisherman in your life. 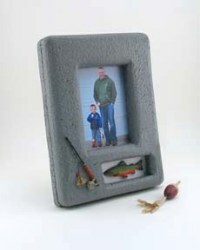 STYROFOAM forms the base and miniature fishing decorations make this a perfect homemade Father's Day gift. Dad will be proud to display this handmade frame at home or in the office. 1 Make It: Fun® Sheet, 15/16″ x 11-15/16″ x 17-15/16"
Use Foam Cutter to horizontally cut STYROFOAM™ sheet in half, making two pieces (close to 9″ x 12″) for front and back. Cut scraps of newspaper 4″ x 6″ and 1/2″ x 4″ to use as patterns for photo and fish openings in frame. (Check to be sure fish will fit inside that shape and photo extends beyond it for taping.) Refer to photo and position patterns onto one STYROFOAM™ piece. Trace around patterns with marker. In a well-ventilated area, protect work area with newspapers and follow manufacturer’s instructions to spray frame front and edges with Quarry texture paint. Let dry. Similarly, spray frame back and edges. Let dry. Apply as many coats as desired to create a concrete look, intentionally allowing there to be some holes and imperfections. Let completely dry. Use transparent tape to attach photo and scrapbook paper to back side of frame front. On front, use tacky glue to attach fish to paper in opening. Glue fishing pole to bottom left. Use glue gun to glue back to front. Let all glue dry. For hanger, slightly bend open a paper clip. On back of frame, 3″ from top and centered, insert small end of paper clip into back side of frame, angling up so that large end becomes a loop. Use glue gun if needed to hold.